Welcome to the Wilds of Easter Island where tribal bunnies roam free in search of Easter eggs and sustenance. This ancient archipelago is home to a lot more than docile statues. 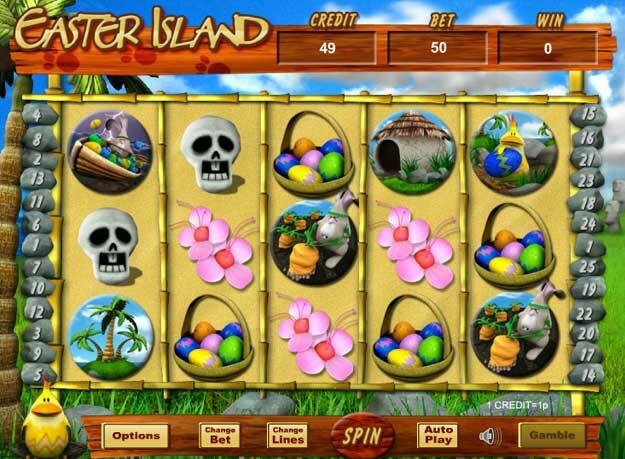 Challenge the witch-doctor bunny in the final round to double your winnings in this tropical online slot adventure. Click to view UK slots. Eyecon has founded way back in 1997 as a computer game company after eventually moving into the online slot market in 1999. Their games include various timeless classics that players have loved and continued to play year after year. After Fluffy Favourites release in 2006, it remains one of the much-revered games of the online slot market. View slot games online here to see an extensive list of all our games. The reels are filled with cartoon style graphics of flowers, Easter baskets and more. The Wild is the cute little Bunny, and can take the place of any symbol except for the Scatter, of which within in this hopping mad game there are 2 scatters. First up is the Easter Bird, which will trigger your Bonus prize when 3 or more appear. Then the other Scatter for your taking is the Bunny Combination, 3 or more of these will trigger your Free spins round and there are up to 50 to get your teeth into, it can even be retriggered as well! You can place bets for as little as £0.01 or up to £2.00. The game also gives you the option to select 1 to 25 paylines. Make use of the super cool “Auto-Play” feature to choose from either 10, 15, 20 or 25 games to spin round. There are 4 wild symbols on this game and these will appear as adorably cute Dancer symbols. When they pop up anywhere on the reels, the dancers will make your wins dance too by substituting for all other symbols, except from the scattered egg symbols. Your prizes are even doubled when the wilds appear in a line win. If you are lucky enough in this Easter bonanza of a game to get either 3, 4 or 5 of the scatter Dancer symbols, they will trigger 15, 20 or even 25 Free games, prizes can even be tripled in the free spin feature and of which can even be retriggered up to an amazing maximum spinoff of up to 15 times! The pretty Easter egg symbol in this game is the scatter, when 3 or more such symbols show up anywhere on the reels, you enter the “Prize Pick” round. Get one pick for each scattered Egg symbol in the triggering combination and each pick can bring you a prize even Jesus himself would wish for! 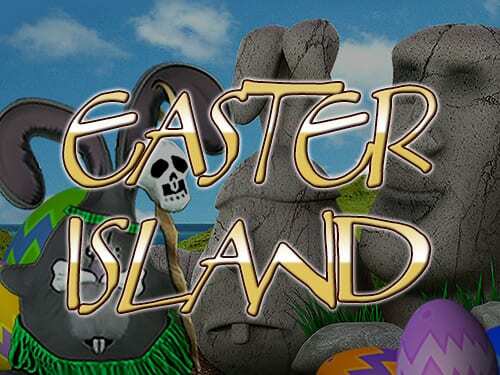 Easter Island also offers a Gamble Bonus round, when a win is awarded, hit the “Gamble” button. Another game screen will appear, where you will find the hopping dancing rabbit! Then you just have the option to either hit on the blue icon to gamble your current bet or the red icon to gamble to win twice your bet.